Over the past 100 years, a man’s role and way of being has changed dramatically. More men are coming to the understanding that they have an emotional side to them. Men are now less effective as the leader of their families. Men are now not always the sole bread winner. Men also do not date or court women as they once did. Many changes in lifestyle and generational beliefs have been left by the wayside to make room for new norms. But with all this change, which I believe is not all bad, I ask you, men, “Have we lost some vital parts of being a man that we could still use to improve our families, our own self-esteem, our marriages, our careers, our parenting and our communities as a whole. It pains me to think that every day in the news I hear of people not treating each other decently. I continue to wonder if we have lost our way. Men, does it start and end with us? I believe that we could at least help to improve this mess that we are in, by going back to some of what we once were. So here are 7 ways men have changed and a description of how that affects the world you live in. Are we still leaders of the family? Let me preface this. I am not talking about men being the iron fist of the past. However, I am talking about the fathers and husbands that were gentle, loving, compassionate, decisive, God-fearing and strong. Being a leader of the family means to model appropriate behavior, choices and emotions so that others in the house can learn from your example. Good leaders always “lead by example.” I believe some men in this world still do this, but many struggle to keep up and lead in the way that a family needs them to. Are we gentlemen? Where have all the gentlemen gone? When was the last time you opened the door for your wife? Or pulled her chair out so she could sit down? Again, I am not talking about stiff authority. I am trying to point out that many men today have lost the self-less attitude and compassion for doing things right and treating their wife with “gentleness.” I try to tell my wife regularly she is my princess. How does a person treat a princess? Probably by doing everything they feasibly can for her. I believe in a love relationship, women still long to have a man who knows how to be gentle, soft-spoken and to treat her as a lady should be treated. Have men lost the ability to strong? I believe we have an epidemic of weak men in this country. If another country attacked our nation today, would we have men who spring into action to protect and fight back? I believe in times of crisis men will stand up, but I also believe this should be true for little things. I don’t believe men are as strong today as they were in the past. 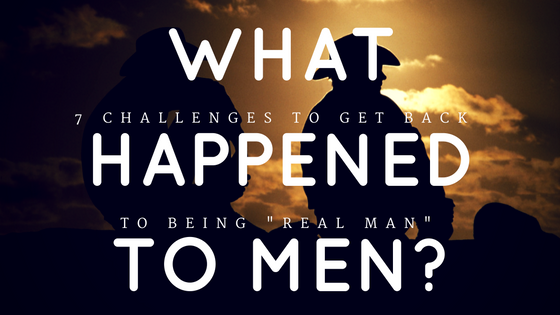 Life is hard, but more men are caving to the enormity of the pressures surrounding them. I am not talking about muscles guys. I am talking about inner strength. I am talking about will-power, heart and soul. So many movies have been created by Hollywood that demonstrate these characteristics (i.e., Rudy, Rocky, The Pursuit of Happiness, Remember the Titans). Where are the men that have the will to overcome? To be more direct, where are the men who will strive to get a job, even when the world is against them? Where are the men who will stay in a child’s life even when their marriage is on the ropes? Finally, where are the men that will fight for their marriage and not use divorce as a way out? Again, I am not talking about all men, but I believe there is a major decline in men with these types of characteristics to overcome. Have we lost our ability to be moral and ethical? Maybe a greater question is, “What is right and wrong as defined in our country at this place and time?” Our country is split in our beliefs, but right and wrong have always been defined and specific. Every man and woman in our nation has a least a few central connected beliefs (i.e., the right to live, the right to have their basic needs met, the right to be safe, etc.). I believe that some of these beliefs are been lost. Men, how are you affecting this outcome? Men need to remember what’s right and what’s wrong and live and die by those beliefs in order to help our country get back to that standard of living. Also, ethics plays a big role. Should you not do what you say you are going to do? Please, if you want to be trusted, especially by your spouse, be who you say you are and do what you say you are going to do. Remember the paragraph about strength? Does it not take a certain amount of strength to live with ethics and morality, especially when no one else is living or working that way? Back in the medieval ages when kings and knights were ruling and castles were the estates of the mighty, chivalry was abundant, at least that’s what we are led to believe. Remember Robin Hood? Remember tales of the black and white knights? Chivalry was a characteristic that knights were expected to uphold. The definition of Chivalry is the system of values (such as loyalty and honor) that knights in the Middle Ages were expected to follow. This system included respect and politeness, especially toward women. Some might use the term graciousness or courteous. Today, men can portray these characteristics by being thoughtful and respectful of others, not just women. The Bible say honor your mother and father. Honoring others is an important part of being chivalrous. How often do you see men being chivalrous towards others? Values seem to have changed dramatically in this country. I believe that some people don’t even know, or care what they value. People live on autopilot every day. Men, we cannot live on autopilot and be effective in our families, jobs, or communities. What are your values? Know them! Keep them on a piece of paper on your bathroom mirror. Traditional values were God/Spirituality, family, and hard work. What other values can you name to help you be a better man? I remember a statistic from my home state, Georgia, about a family having a father who was involved and the effects on academic success. Apparently, higher academic success was seen in families in and around rural, middle Georgia where many families have 2 parent homes. Alternatively, lower academic success was seen in and around a much more populated area of Georgia where single parent homes were more the norm. Other statistics and information can be found on fatherless statistics and achievement in two parent homes. These statistics demonstrate the need for a strong, involved and loving father figure to be in a child’s life, especially to help with the success of a child’s future. Where else is a child going to learn the things they need to know that only a father can teach them. Disclaimer: Mother’s, I in no way discount your hard work and the value that a loving, nurturing mother has in a child’s life. I believe mother’s probably have greater impact that father’s, but both are critically important. Also, men, if you want to study more about the Biblical reasons behind this, it is very enlightening. God provided children with his whole self through the husband-wife-Holy Spirit triad. Are you a man of God? Do you fear God? Do you read your Bible? Do you pray regularly? Do you even believe God exists? I believe men have lost their faith in the one who got us here. Remember our founding fathers? They believed in God. They believed him so much they started a new country, in a new land, and fought a war against a powerful king to try to worship the way they knew they needed to. If you have any faith, please allow this fact to strengthen it. Our country most likely would not exist as it is and with the blessings we have been give if it were not for God-fearing mean, holding onto faith that God would free them and allow them to worship him freely. We have lost this faith. Look at the people trying to remove the phrase, “In God we trust,” as a slogan our country has kept for a long time. What about people trying to remove the ten commandments from court houses or state building? Are not our laws centered around some of these commandments? Men, if we are going to be who we truly need to be, we have to center our lives around the One who created the male gender. I have said so much, but so little in this article. I hope that men in this country are inspired by these words to be the men of integrity, chivalry, and God that they were designed to be. It will help us individually. It will help our families. I will help our communities. It will help our careers. And ultimately, it will help our country and world. If only all the men of our country would turn back to what got us where we are, without turning back to the evil of the past (i.e., slavery, racism, and oppression of the rights and abilities of others). We can lead the charge in helping others be better. I call all men to change for the better and don’t give up on yourself as a vessel for hope.